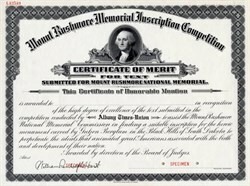 Beautiful RARE specimen certificate for Contest by the Albany Times Union, New York from the Mount Rushore Memorial Inscription Competition. This historic document was printed by the American Bank Note Company and has an ornate border around it with a vignette George Washington. Certificate has William Randolf Hearst's printed signature. Original plans for the carving of Mount Rushmore included a large inscription called the Entablature. The sculptor of Mount Rushmore, Gutzon Borglum, intended to carve the Entablature in an area shaped like the territory of the Louisiana Purchase using large, three-foot tall letters. The Entablature was to be a brief history of the United States, symbolized by Washington, Jefferson, Roosevelt and Lincoln, carved beside the four faces. The Entablature would emphasize that Mount Rushmore was a national memorial, commemorating the first 150 years of the United States, not just the lives of the four great men. The Entablature was begun in 1930, when the year 1776 was carved into the eastern side of the mountain. However, in 1934, due to inconsistencies in the rock, the Thomas Jefferson figure was relocated from Washington�s right to Washington�s left. As a result of the recomposition, the Entablature location had to be used for the Lincoln figure. Borglum has also concluded that the words on the Entablature were going to be too difficult to read from below. Thus, it was decided that the inscription of historical events would go inside the Hall of Records, a room behind the sculpture, rather than on the front of the mountain. Gutzon Borglum died in 1941 before plans for the inscription were finalized. Initially, Calvin Coolidge was to write the History of the United States that would be carved on the Entablature, but he and Borglum disagreed on how the history should be worded. Calvin Coolidge died in 1933 before any definite wording was decided. In 1934, a year after Coolidge's death, Borglum took a different tack with the Entablature text. He went to newspaper publisher William Randolph Hearst and asked him to publicize a contest to write the text. Hearst agreed, and agreed to supply cash and scholarships as prizes. All contestants had to use the same nine dates for their time lines. Thousands of essays were submitted and a grand prize was awarded for the best essay overall. The overall winner was John Edward Bradley. Winners were also selected and prizes awarded in grammar school, high school, and college divisions. On July 4, 1971, William Andrew Burkett, the College Division winner, donated a bronze plaque of his award-winning essay, written in 1934 while attending Omaha University Law School. The plaque now hands on the Borglum View Terrace at the memorial. Burkett�s 560-word �History of the United States of America, 1776-1904� is as follows: Almighty God, from this pulpit of stone the American people render thanksgiving and praise for the new era of civilization brought forth upon this continent. Centuries of tyrannical oppression sent to these shores, God-fearing men to seek in freedom the guidance of the benevolent hand in the progress toward wisdom, goodness toward men, and piety toward God. 1776 Consequently, on July 4, 1776, our forefathers promulgated a principle never before successfully asserted, that life, liberty, equality, and pursuit of happiness were the birthrights of all mankind. In this declaration of independence beat a heart for all humanity. It declared this country free from British rule and announced the inalienable sovereignty of the people. Freedom�s soldiers victoriously consecrated this land with their life�s blood to be free forever more. 1861-65. The deadly doctrines of secession and slavery were then purged away in blood. The seal of the Union�s finality set by President Lincoln, was accomplished like all our triumphs of law and humanity, through the wisdom and the power of an honest, Christian heart. Far-sighted American statesmanship acquired by treaties, vast wilderness territories, where progressive, adventurous Americans spread civilization and Christianity. 1803 In 1803, Louisiana was purchased from France. This acquisition extended from the Mississippi River, across the fertile prairie to the Rocky Mountains, and paved the way for America�s preeminence among the nations. 1819 In 1819, the picturesque Florida peninsula was ceded as payment of Spanish obligations due to Americans. 1845 In 1845, Texas, having patterned American democracy during the ten years of freedom from Mexican rule, accepted the invitation to join the sisterhood of states. In 1846, the Oregon country was peacefully apportioned by the 49th parallel as the compromised international boundary of the two English-speaking nations. 1848 In 1848, California and territory likewise rich in natural resources was acquired as the consequence of an inevitable conflict with Mexico. In spirit of mutual concession, the United States granted additional indemnities for the adjustment of the international boundary, extending from the Rio Grande to the Gulf of Mexico. 1850 In 1850, Texas willingly ceded the disputed Rio Grande region, thus ending the dramatic acquisition of the west. 1867 In 1867, Alaska was purchased from Russia. William Randolph Hearst April 29, 1863 � August 14, 1951) was an American newspaper publisher who built the nation�s largest newspaper chain and whose methods profoundly influenced American journalism. Hearst entered the publishing business in 1887, after taking control of The San Francisco Examiner from his father. Moving to New York City, he acquired The New York Journal and engaged in a bitter circulation war with Joseph Pulitzer's New York World which led to the creation of yellow journalism�sensationalized stories of dubious veracity. Acquiring more newspapers, Hearst created a chain that numbered nearly 30 papers in major American cities at its peak. He later expanded to magazines, creating the largest newspaper and magazine business in the world. He was twice elected as a Democrat to the U.S. House of Representatives, and ran unsuccessfully for Mayor of New York City in 1905 and 1909, for Governor of New York in 1906, and for Lieutenant Governor of New York in 1910. Nonetheless, through his newspapers and magazines, he exercised enormous political influence, and is sometimes credited with pushing public opinion in the United States into a war with Spain in 1898. His life story was a source of inspiration for the development of the lead character in Orson Welles' film Citizen Kane. His mansion, Hearst Castle, near San Simeon, California, on a hill overlooking the Pacific Ocean, halfway between Los Angeles and San Francisco, was donated by the Hearst Corporation to the state of California in 1957, and is now a State Historical Monument and a National Historic Landmark, open for public tours. Hearst formally named the estate La Cuesta Encantada ("The Enchanted Slope"), but he usually just called it "the ranch".